5/23/2008 12:21:29 PM Mountain TG:: Harry is a scoundrel!!!!! 5/23/2008 11:11:13 AM Mountain TG:: Al, is this a two moon day. Moon to Moon drop today, or Moon noon Moon (with solar noon at 1:00). 5/23/2008 10:25:13 AM Mountain TG:: On moves 1 and 3, in the potential 6 day FOP I'm watching, Xbar support was brokent than market rallied back up to X bar support. 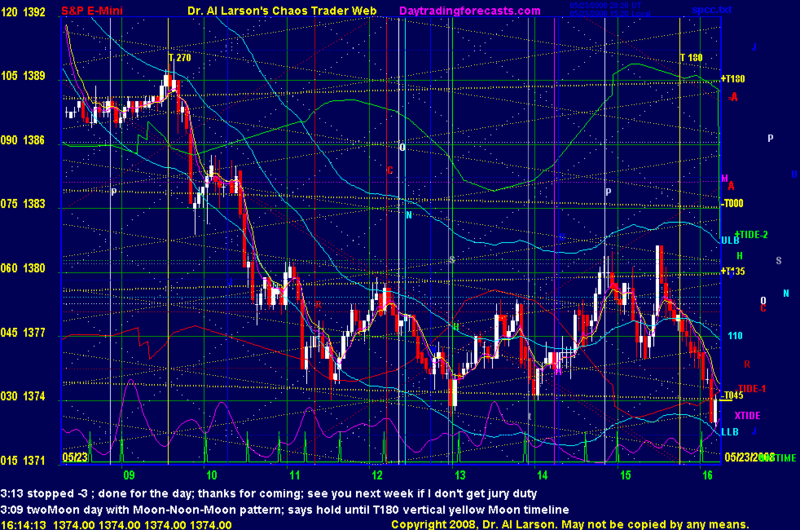 So certainly potential is there for a lower low today, but a move 6 up in the multiday fractal is lurking. 5/23/2008 10:20:32 AM Mountain TG:: Yes, I use all CTME course tools and FOP tools regularly in Wave59 and his quick PFE tool and larson bands (% envelope around a moving average) in eSignal. Esignal is my datafeed to Wave59. I also keep Qcharts as a backup platform of livequotes and I'm able to download large amounts of historical data from them but when the market starts moveing quickly on heavy volume Qcharts can start to lag the live data. 5/23/2008 10:15:35 AM Mountain TG:: Good chance move 5 of 7 down completed this morning on a 6 day FOP, seems to have touched 3rd Xbar anyway and looks set up for a move 6 correction into the close. I have reasonable expectation of a low in the mid 1350s on Wed morning timeframe. 5/23/2008 10:09:10 AM Mountain skarabeus:: TG, are you using the stuff from AL with W59 or ESignal? I dont have Esignal. 5/23/2008 10:02:35 AM Mountain TG:: Yes, I use Wave59. I look at charts on Wave59 and Esignal on two screens. 5/23/2008 10:00:28 AM Mountain TG:: Al, when I first started following your work quite a number of years ago, I tried to trade like you, i.e., on a discretionary basis based on a set of principals but I wasn't ready for that approach. I don't think it is an approach for rookies unless they have some innate trading abilities I didn't have. So I worked exceptionally hard on putting together a much more rigid system of evolving rules. This worked ok, some would say better than ok as on a total annual return basis results were very good. But it was not enjoyable to trade that way (pretty much like a computer). So more recently I tried going back to a discretionary trading approach based on a set of principals centered around the chaos course work and the trading principals you generously demonstrate on Friday's and this works very well now. 5/23/2008 9:48:06 AM Mountain skarabeus:: Hello, is anyone from you guys trading with Wave59 and the chaos tools from Al? I am just asking because I want to step into the chaos community. 5/23/2008 9:46:51 AM Mountain TG:: Grabbed 2 more on move 7 down for today, move 13 down from yesterday's afternoon top. Nearly went long at 76 but not in a buying mood just yet. Last two trades, only used a 1 point stop initially. 5/23/2008 9:35:54 AM Mountain Al:: TG, Congrats, and give yourself credit for putting in the long hours of study- so few people have the drive to do that. 5/23/2008 9:25:29 AM Mountain TG:: Picked up another 3 points on that last drop as price consolidated into my last fractal grid streak and started to drop on it perfectly. Again, amazing that on such a relatively small scale, at times there is no excessive noise and a tool like the fractal grid can work perfectly. Al, I'm getting the hang of this stuff and I owe a lot of it to you. Recently had a streak of 3 weeks with no losing days. Was very in tune with the fractals. 5/23/2008 8:56:16 AM Mountain TG:: was up 10 so locked in 8 and got hit at 79.5. +8 on a Friday before a holiday is very good as a lot of times these days just get stuck in low volatility in the afternoon. 5/23/2008 8:34:58 AM Mountain TG:: I'm using a fractal grid geared to a 4 hr FOP from yesterday's 1:50 est high, doing so, the market just turned down right at a key spot in the grid. Amazing.